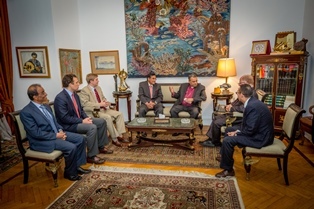 CAIRO, EGYPT (ANS – April 21, 2017) — Following the recent ISIS attacks on two Coptic churches, which claimed at least 44 lives, Leading The Way Founder and President Dr. Michael Youssef is in Egypt this week for a series of urgent meetings, seeking to bring peace to the country of his birth. He joined Nick Ayers, campaign manager for US Vice President Mike Pence, for strategic talks with Egypt’s key parliamentary national leaders to discuss how the US and Egypt can work together to eradicate terrorism. 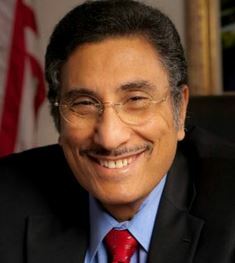 Leading The Way’s Founder and President said the meetings were very effective as Ayers and Egypt’s officials shared their confidence in building trust and support for a more peaceful and secure future. Dr. Youssef’s passion to expose the mission and motives of radical Islam is highlighted in his most recent book The Barbarians Are Here, which has gained international attention. In The Barbarians Are Here, Dr. Youssef challenges Christians to tackle the threat Islamic terrorism poses to our freedoms by taking a stand for the Gospel. 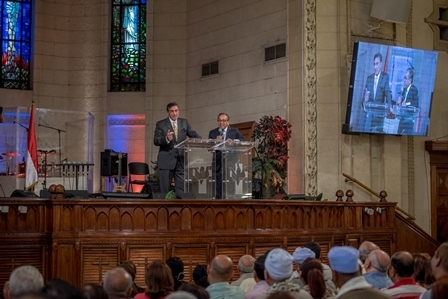 Dr. Youssef concluded his trip to Egypt by preaching a timely message in Cairo. Following the Palm Sunday attacks on two Egyptian churches, Dr. Youssef shared a powerful word of hope to Christians in the region. Thousands attended the service and were encouraged as Dr. Youssef spoke of God’s faithfulness and sovereignty in the face of great evil and injustice. To learn more about Leading The Way’s Gospel outreach here in the UK and in the Muslim world, please visit LTW.org or call +44 (0) 800 432 0419. 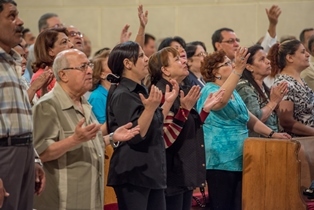 Now celebrating over 25 years of ministry, Leading The Way’s television and radio programs are broadcast to more than 190 countries in 24 languages. Leading The Way also produces DVDs, CDs, books, a monthly devotional magazine, and daily e-devotionals to spread the light of Christ. This Atlanta-based organization partners internationally with in-country follow-up teams to encourage new believers in their faith and to provide tangible support to persecuted believers around the world. He has authored more than 30 books, including popular titles like Jesus, Jihad and Peace, The Leadership Style of Jesus, and When The Crosses Are Gone. From the perspective of a Ph.D. with a focus on radical Islam, his Middle Eastern heritage, his life’s work as a respected Christian leader, and backed by decades of research, his new book The Barbarians Are Here is a wake-up call to know the truth about radical Islam — and the only solution to defeating it. Editor’s Note: For media enquiries contact Peter Wooding by phone at +44 (0) 7500 903067 or by e-mail at woodingpeter@hotmail.com. Photo Captions: 1) Dr. Youssef shares a timely message about God’s power in the midst of evil to the congregation at Kasr El Dobara Church in Cairo, Egypt. More than 2,000 people were in attendance. 2) Dr. Michael Youssef, Joshua Youssef, and Nick Ayers meet with Egyptian leaders to discuss strategies for confronting the threat of radical Islam. 3) Egyptian Christians find strength and encouragement during a time of worship and teaching with Dr. Youssef at Kasr El Dobara Church, the largest evangelical church in Egypt. 4) Dr. Michael Youssef. 5) Peter Wooding filming in London. 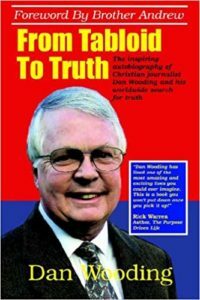 About the writer: Peter Wooding, the younger son of Dan and Norma Wooding, is an award-winning radio, TV, and print journalist. Having previously spent 10 years as news editor with UCB Radio in the UK, he has travelled extensively reporting from countries including Greece, Russia, Serbia, South Sudan, the Philippines, Uganda, South Korea, Zambia, Gambia, Mozambique, Croatia, Israel and India. Peter, whose most recent trip was to Ukraine, reports regularly for ASSIST News Service, The Message Trust, New Life Publishing, and Leading The Way. Peter, who has recently been appointed London Bureau Chief for the Global News Alliance, and his wife Sharon live in North Wales, UK, with their three daughters, Sarah, Anna and Abigail. To contact Peter, please e-mail him at: woodingpeter@hotmail.com or via the telephone at: +44 (0) 7500 903067.